In about a week and a half, I will be flying to San Francisco to teach a workshop on tufting. I LOVE to tuft. But since I’ve been on an upholstery hiatus the past couple of years, I thought I should brush up on my tufting skills before I teach the class! 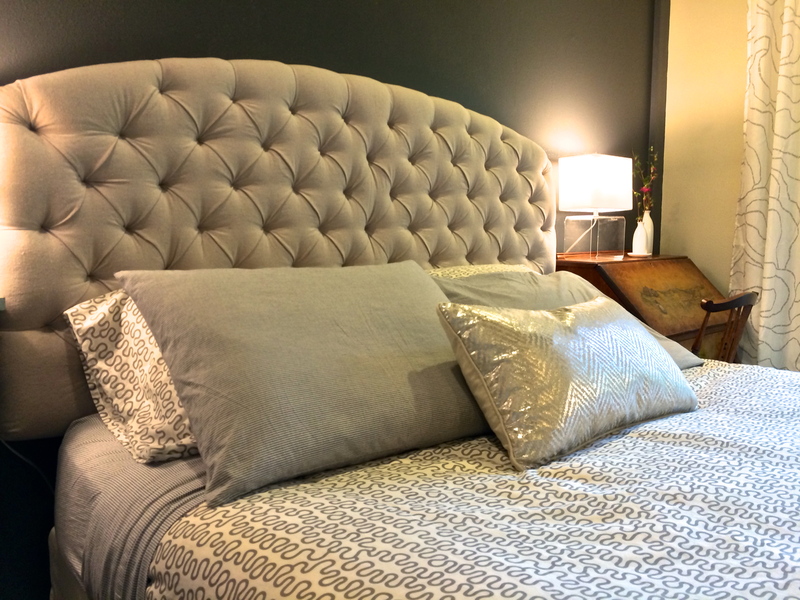 So my husband and I are the lucky recipients of a brand new, gently curved, tufted headboard. And our bedroom is nearly complete! If you’re in the San Francisco area, I’d love for you to join us on Wednesday evening April 9 from 6-8pm at the Paris Flea Market, 535 Leisure St., Livermore CA. It’s just $35! 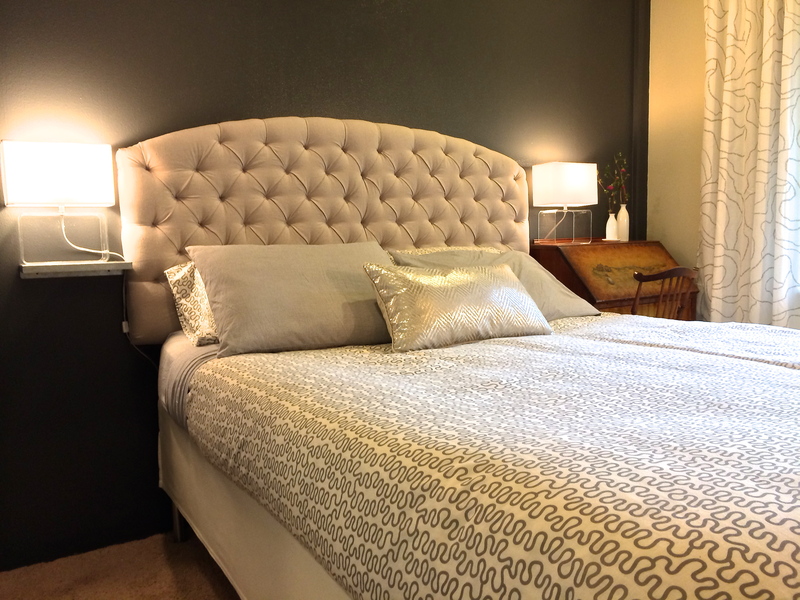 You’ll get a chance to get some hands-on experience, ask any burning upholstery questions and be in the drawing to go home with the finished demonstration headboard. My friend Karen from Redoux Interiors is hosting me and has a Paypal button on her site so you can register and pay easily. Or if you would like to schedule a class for you and your friends, let’s talk! Just use the contact form to reach out. My husband and I are serial remodelers. I know some of you can relate. Both of us are wired as unstructured, artistic/creative types and although it’s fun — we struggle with completing projects. It’s probably because we have 100 projects started and only enough time and $$ to finish, oh, say . . . one. However, since moving my upholstery studio back home over a year ago, the plan has been to finish out the garage so that I can move all my tools, massive work table and supplies out of my house. It may be a year overdue, but I’m happy to report that last week it happened! What’s more, it happened in exactly one day. Scott took the week off from work, our kids were surprisingly self occupied and it just . . . happened. Sort of. First Scott felt the large window needed to be moved up to match the height of the other windows, so that ate up a day. 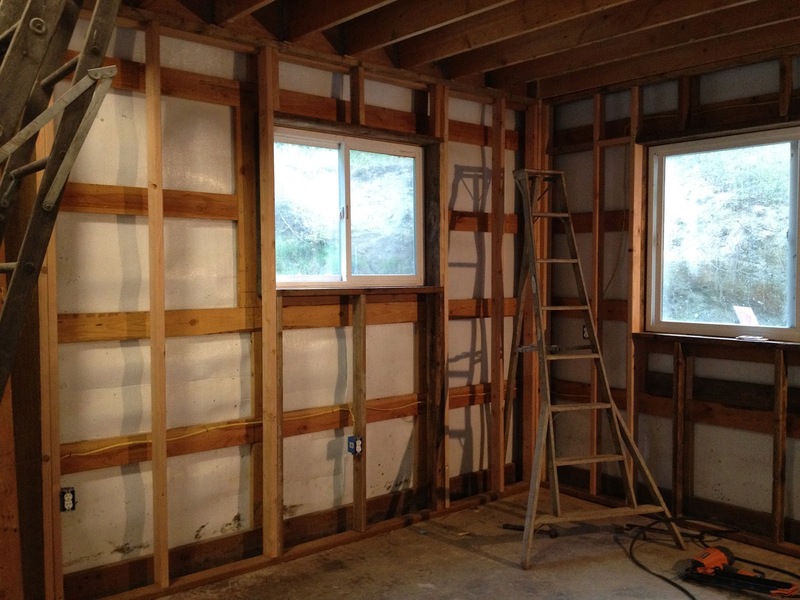 Then he spent another day’s worth of time framing the walls with 2×4’s. Scott used a gift card to buy the 2×4’s for framing. He scrounged some salvage wood from his ample supply to frame the windows. The insulation came from another salvaged stockpile. We’ve had bags of insulation in the garage loft waiting to be used for years. 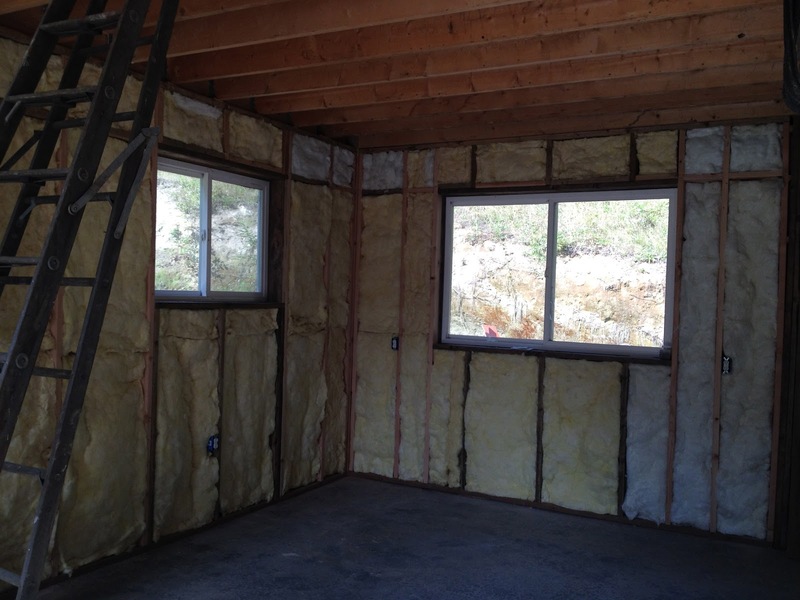 Not only does the salvaged insulation get used in the walls, but now the garage loft is that much more cleared out. The plywood was purchased new, but buying exactly what we needed made this project go quickly. New wall mounted lights were another long-stored supply from Scott’s free collection. The guy is a salvage magnet! Now that was a good day’s work! 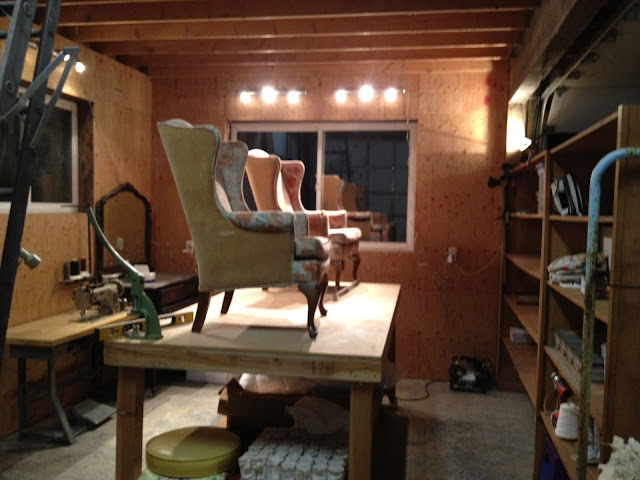 I can’t promise I’ll be more prolific with upholstery projects. I’m still at somewhat of a crossroads with my work future. But, when inspiration does strike, it’s nice to know I can commute 10 steps to an organized, dedicated space. It’s probably one of the biggest projects to be crossed off the list and that feels good. Really good.